Parts of the Pacific are warming up and drawing surfers and fisherman — but that's not necessarily good news. LOS ANGELES — Joe Roper has been surfing off the coast of San Diego for five decades. He's rarely experienced water this warm. "All of a sudden it has turned into a bathtub," said the board repairman. "It's insane. I've never heard of 80 degree water here." Scientists on Thursday announced that the sea surface temperature off the coast of La Jolla, California, came in at 78.6 degrees — the warmest it's ever been in the 102 years measurements have been recorded. Earlier in the week, the National Weather Service (NWS) in San Diego recorded sea surface temperature of 80 degrees a few miles north, off Solana Beach. 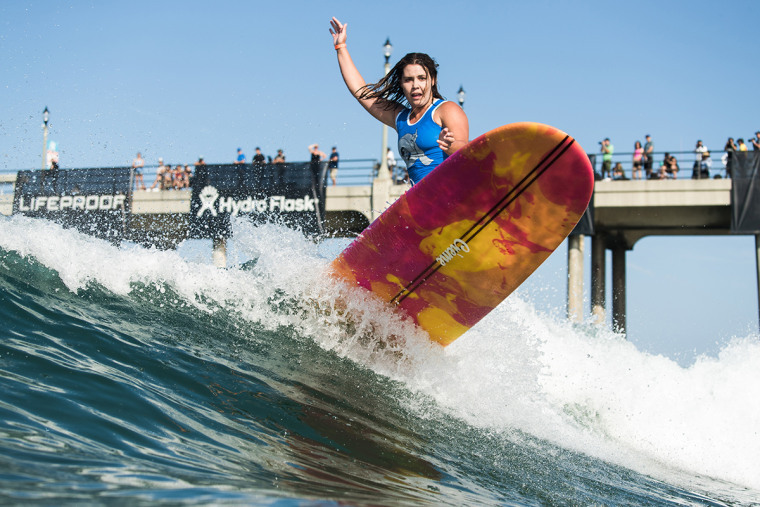 The once-in-a-lifetime, tropical weather is sending hordes to the shores, but they're also changing the very nature of classic Southern California beach weather, long influenced by cool breezes and waters chilled by the north-to-south California Current. The NWS recently measured a dew point in San Diego of 70, which indicates an environment that feels positively sticky. "It's over the top," says NWS meteorologist Alex Tardy. "It’s making the nights warmer, the days muggier and the sea breeze doesn't work as well as it usually does." Sport fishing aficionados are nonetheless having a field day. "Bluefin tuna has been here forever, but the volume in the last three to four years has been more than I’ve seen in my lifetime," said Ken Franke, president of the Sportfishing Association of California. "Right now there’s an incredibly large volume of bluefin tuna — anywhere from 10 pounders from 300 pounders, a couple hunderd tons in a single school." Practitioners of sport fishing are limited by law to two bluefin a day per person, he says, but there's a wealth of other coveted seafood off the Southern California coast, including yellowtail and dorado. "It’s like going through a drive-thru at McDonald's for fish," Franke says. Bait species, including anchovies, are plentiful, too, experts say. The bounty for those who fish, however, could portend harmful long-term changes. Warmer waters can affect the development of plankton and kelp, foods at the bottom of the chain, said Elizabeth Argyle, director of education at the Living Coast Discovery Center in Chula Vista, California. "We’re starting to witness fish species found near coastal waters migrating offshore in search of plankton," she said. "That affects sea lions, predators, trying to chase those fish going further offshore to hunt." She added that seaborne diseases spread more rapidly and afflict ocean wildlife more commonly in warming waters. Heal the Bay coastal marine scientist Mary Luna said via email that scientists will likely see major changes in sea life if the warming trend continues. "Off the coast of California it is believed that sustained warmer water temperatures will result in shifts, expansions or reductions in the range of commercially important species or the species that depend on them," she said. "A few years ago we saw hammerhead sharks all the way up to Malibu, which is not a normal occurrence." Halibut could be displaced. "Juvenile and adult California halibut may have different diets, and therefore different stages of their life cycle may be affected by warmer waters off of our coast," she said. Apryl Boyle, an associate director at environmental nonprofit Heal the Bay, agreed, saying the warm ocean creates sea life departures and incursions not normally seen off the coast. "We see species off of the California coast travel farther north than they normally do to follow their food," she said via email. "A few years ago we saw hammerhead sharks all the way up to Malibu, which is not a normal occurrence. In addition, we saw sea snakes along the Southern California coast, which again is not their normal distribution." Luna said that sustained sea surface temperatures can also boost rising sea levels, especially when warm oceans fuel winter storms that flood populated beach communities. "During those events coastal communities increasingly see ocean water encroaching into sidewalks and property, places that ocean water and waves historically did not reach," she said. The last four Southern California summers have seen unusually high sea surface temperatures, said Daniel Rudnick, professor of climate, atmospheric science and physical oceanography at the Scripps Institution of Oceanography, which recorded the all-time high reading off La Jolla. The warmth has been measured along the entire Southern California Bight and then some — from Baja California to Point Conception, observers say. "Back in 2014, early on, the water started warming," Rudnick said. "We called it a marine heat wave. The press it called 'the blob.' That warmed up the water for a year. The following year we got one of the biggest El Niños of the past few decades, and that warmed up the water even more. Then there was a La Niña — a cooler-than-normal phase — but the water never really got back to the normal." "For now, this is the new normal," the researcher said. The normally cool waters of the Pacific have historically served to slam the door on hurricane activity, but the sustained warmth off the coast of Southern California in recent years could change that. Hurricanes reached Long Beach in 1939 and San Diego in the 1800s, experts have said, but otherwise they're more rare than snow here. The National Weather Service's Tardy says hurricane season off the Pacific coast of Mexico "started off busy" this summer. But storms aiming at Southern California would still have a formidable hurdle: High pressure systems over the Southwest that have produced two record-breaking heat waves so far this summer. "It's not like all of a sudden we would expect a Category 1 or 2 hurricane," Tardy said. "That said, we can get tropical rains." Rudnick of Scripps agreed: "I’m not forecasting any hurricanes. I’m not ready to go there yet." Forecasters and scientists get enthused when the weather breaks records. But Southern California surfers are notoriously hard to impress. "It’s been like this the last couple summers," said Kevin Wallis, lead forecaster at wave prediction website Surfline. "It’s great. We love it. When the water is this warm it means no wetsuits."